Now we will examine 9 layers particular to Lillklobb itself that will help serve to identify design potential and parameters (which are two sides of the same coin). These 9 layers examine the site as it is, rather than how we might wish it to be. While they cannot encompass the totality of the site’s character, nine lenses, at a 2.5 ha scale, create a sufficiently accurate medium resolution model of the territory. This model has enough detail to allow us to begin thinking of the property as a system, one in which the patterns of design elements can be tested. The diagrams are intended to be easy to read and serve as reference material for people wishing to acquaint themselves with the property as I interpreted it: in the future it should help explain why design decisions were made. When it comes time to design specific details, these 9 lenses can be applied again more closely for a micro picture of the area being designed. Today I will publish the diagrams and text for the first three: Landform, Water, and Access & Circulation. Lillklobb is 2.5 hectares (6.17 acres) in size and has a rather straightforward topographical layout. The summit of the hill is almost precisely in the middle of the property at stands at 18 meters above sea level. From that summit, natural and manmade ridgelines extend towards the four corners of the property at an easy rate. Bedrock is comprised of granite and there are a couple of places near the summit where the bedrock is exposed. Elsewhere the depth of soil is probably at least one meter given the health of the hardwood species on site. The vast majority of the site sits over two meters above the stream beds which run to the southwest and east of the property. The northern wedge and central summit of the property have been significantly altered by human activity with the creation of parking lots around the old barn-turned-theater. The eastern side of the property is demarcated by the strongest ridge on the property which runs from the summit southeast. From this ridge the contours of the eastern portion of the land radiate gently out and to the north; but between the ridge line itself and those contours is a quite distinct drop of up to two meters. The other significant deviation from gentle slopes here is the drainage ditch along the north eastern corner of the property which drains the yard of the main house, to a pipe buried under the access road and into another, more shallow, open ditch that culminates in the perennial stream in the neighboring park. The southern bounds of the property lie between the strong southeastern ridge and another manmade ridge running to the southwest. This area is the most gentle on the property, though the old foundation stones of various buildings create some localized variation. There is also another drainage ditch helped keep the yard of an old house well drained. On the western side of the property there are two distinct regions that have been created by man: a large old barn’s foundation stones create a situation along the central western portion that are not reflected on the maps and warrant attention as its own subsection of the property. North of this section is a relatively flat area, which used to be a barnyard, which runs until the northwestern ridge line. As seen before in the previous section, a light industrial facility occupies the land west of Lillklobb. When these factories were built, heavy machinery cut into the hill to create a level building surface. This cut still exists and is quite prominent all along the property line. Lillklobb’s almost textbook example of a “hill” lends itself quite well to diverse land use: with four distinct aspects, one can utilize permaculture design in an almost classical fashion. Since the terrain is unchallenging to transverse, the site will have smooth flows of people and material, increasing efficiency and long term suitability as a working farm. Lillklobb’s water situation is, perhaps, its weakest link. Since there are two buildings with running water (and electricity), access to the municipal water system is guaranteed for at least a portion of the site. This water originates in Lake Päijänne, which serves as the source for all municipal water in the Helsinki region. The water is treated at Pitäkoski and is of high quality, no fluoride is added but the water does contain bound chlorine in low doses. Water pricing depends upon use and property type and since the site has not been a farm in a very long time, it remains to be seen how they will differentiate use on the farm from that of the office space. There is an old, uncapped well on the extreme northeast side of the property which used to service the main house. The water quality is currently unknown and would need to be tested for a wide array of pollutants before it could safely be used for irrigation. Even if polluted, it is possible that a John Todd inspired ecomachine could sufficiently clean the water. As a distinct landform unto itself, what you see is what you get in terms of water harvesting. A rough calculation based upon 650mm of annual precipitation and a .5 efficiency of that rainfall, one can expect the entire 2.5 ha site to “capture” about 8,125,000 liters per year (which is 8125m3). But such a figure actually informs us very little about water at Lillklobb. 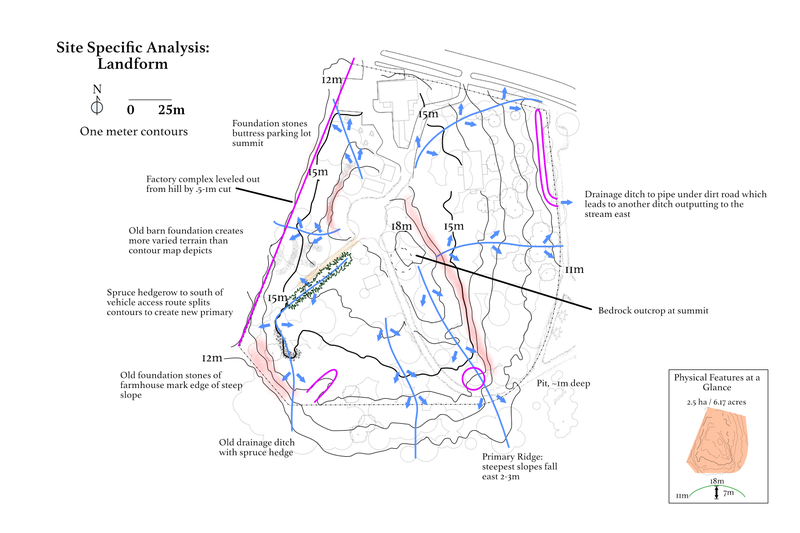 Instead, I’ve broken the property down into six catchments based upon topographic data. Recall that at this level of analysis we are simply creating one level higher resolution image for the site in order to filter large patterns of land use. The first catchment comprises the north/northwestern portion of the property. About half of this catchment is under pavement of one kind or another and slopes northward towards the street. The rainwater harvesting coefficient for this section of the property reaches above .8, but because of its use for automobiles and large tour buses (which bring children to the theater there), this water is not a high priority for capture initially. In the future it could be used to irrigate some ornamental gardens, but shouldn’t be used for food production. Moving eastward in a clockwise fashion, the second catchment encompasses the entire yard of the main house and a portion of the old orchard southward out of the fence. The slope averages about an 8% grade from the west to east and supports many mature linden, oak, elm, maple, spruce, apple and plums along with the smaller species. The majority of the catchment culminates in a two meter deep drainage ditch that marks the eastern end of the property. This ditch ferries water southward a short bit and into a pipe that goes under the service road and into another, more shallow open ditch in the neighboring park- which itself empties into a stream about 50m away. The main house has about 260m2 of roofing divided into five separate sections. Its roofing material is metal and therefore has a high coefficient approaching .9, yielding about 150,000 l of water each year. I will investigate the implications of this in more detail later in the design phase. Currently, this water is directed into downspouts and into the lawn. There are not any glaring signs of erosion or surface runoff, however, there are signs of compaction, though nothing that cannot be alleviated through normal means. The presence of large canopy hardwood trees means that during the growing season a large portion of this catchment’s rainfall is initially buffered then infiltrated into the soil. These trees produce a huge amount of diverse litter each autumn and have the potential for exceptional nutrient cycling and soil building capacity. Lastly, this catchment’s potential for pollution from the vehicle access ways is mitigated by the actual layout of those routes: a slight ridge forms along the fenceline (western edge of the catchment on the map), shunting runoff in the direction of the dark blue arrows pointing northward. 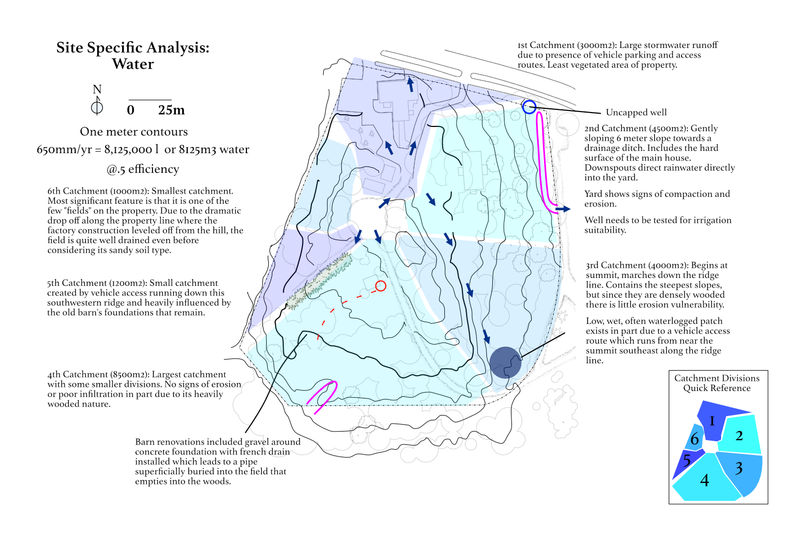 Note, the dark blue arrows pointing south and running to the large blue circle (discussed in the 3rd catchment) also begin at this slight ridge and are protected from runoff as well. Heading south, this catchment appears from the contour map to indistinguishable from the 2nd, but on site observation determines that it is currently separate, though easily connected through design. This area encompasses the majority of the eastern slope of the main ridge that runs to the southwest and is characterized by the steep slope there that levels out quite dramatically to the service road eastward. Existing species analysis reveals that this area is well watered, but there is in fact a problem with infiltration that I’ve indicated with a blue circle. This area has large spacing between plants and bare ground (mostly clay soil, see the soil section coming later). This is probably due to the fact that an infrequently used vehicle track runs southwest from the parking area right along where the ridge begins to level out, which- although the area is highly vegetated and supports many mature hardwood trees- probably leads to some surface runoff that accumulates at the bottom. It should be noted that of all the catchments on the property, this was the most recently cultivated in field production. The northern area of the catchment, as well as the southern of the 2nd, obviously was the old orchard but also was where garden production took place for Lillklobb. Although it is difficult from the old aerial photos to tell, the cultivation pattern was such that it followed the ridgeline southwest and so had, for a long time, created a situation where water was directed to that corner of the field. There is most likely a connection between this past land use and the current puddling and poor infiltration exhibited here. Further investigation should reveal whether this area’s poor infiltration should be alleviated or accentuated as it could be a good place to host a small wildlife pool. By far the largest “single” catchment on the property, this area is defined on both its west and eastern ends by the most prominent ridges on the property. About 80% of the catchment is covered in mix species of hardwoods with a pair of old spruce hedgerows amid the growth. As recently as 1970, there were 7 buildings in this catchment, of which only a portion of an old barn remains standing (near the center there). The old barn had some renovation work done a few years back and that included drainage gravel around the foundation with a pipe that would ferry excess water away, I’ve noted the general direction of this pipe in red. There are zero signs of erosion with even the service vehicle track, now mostly used as a walking path, that runs south southeast being in fair condition in regards to water. This area of the site does not have access to municipal water and its water budget is entirely precipitation based. The plan is to bring municipal water to this area of the site near the crown of the hill to assist in gravity fed irrigation, if need be. It is also possible that, should the well water be suited to irrigation, that a pump could bring water to the summit too, as from there it could centrally water the rest of the property. Small, but distinctive, this fifth area of the property is characterized by the service track which runs southwest from the summit’s parking lot down along the ridge. The track’s north western side sits lower than its southern edge, so any surface runoff drains northward into this area. There is a small open field, highly shaded, that could become quite well watered if this were accentuated. The northern portion of the catchment is defined by the old foundation stones of a large barn which stood here, making water harvesting rather awkward. It has a pattern called “pits and mounds” which lends itself to irregular planting patterns that could create very good ecological services for the property. The smallest of the catchments corresponds to the most regular field on the property and is exceptionally well drained due to its small size, sandy soil, and the drop off along the property line. It is possible that water could be harvested from the earth cellar and old barn roofs in the 1st catchment and brought around to this field if need be. It also sits 2 meters below the highest points of elevation where water storage infrastructure could be built, so gravity irrigation is possible here too. Along with water and soil, permaculture design focusing on access and circulation are considered by Geoff Lawton to be “mainframe” permaculture design. These design elements are the most important to consider as they create the foundation- the main frame- upon which the rest of the system will hinge. Lillklobb’s existing main circulation arteries are already very well defined and some of them are included in the city’s master plan. The main entrance to Lillklobb proper is from the north: the old barn that has been converted to a theater sits on the northernmost end of the property and the paved parking lot that services it is located directly adjacent to the west. This paved lot gives way to crushed granite gravel, which provides a slightly pervious paving material for the majority of the rest of the vehicle access on site. Vehicle access also extends east into the front yard of the manor house, with the another gate to the south accessing the old orchard. The initial drive continues up the northern slope of the hill to a wide, 10m diameter, mostly circular, gravel parking lot. This and all of the earlier described lanes are maintained by the city of Espoo during summer and winter (see blue areas for snow piles). This system is 105 meters in length from main road entry to summit parking and has a rise of 6 meters, for a basic grade of 6% (rounded up). Given the short distance and urban context, this is an acceptable grade for main access to the farm. The pattern of northern access and parking in this hemisphere is also in line with recommendations in permaculture design, which is a major positive point of this location as changing road and parking layout is extremely expensive. From there, two separate drives head in perpendicular directions: one to the southwest and the other to the southeast. Both head, more or less, down the ridge line. The southwestern drive culminates where one of the old farm houses used to stand and is expected, under master planning, to eventually head out of the property and link with a future maintenance drive (pink on the map). It is from this drive that vehicles can reach the centrally located barn. The southeastern drive wraps around the bottom of the ridge and connects with the existing gravel maintenance drive; however, the drive’s ability to convey vehicles disappears where the orange dottted line is on the map. 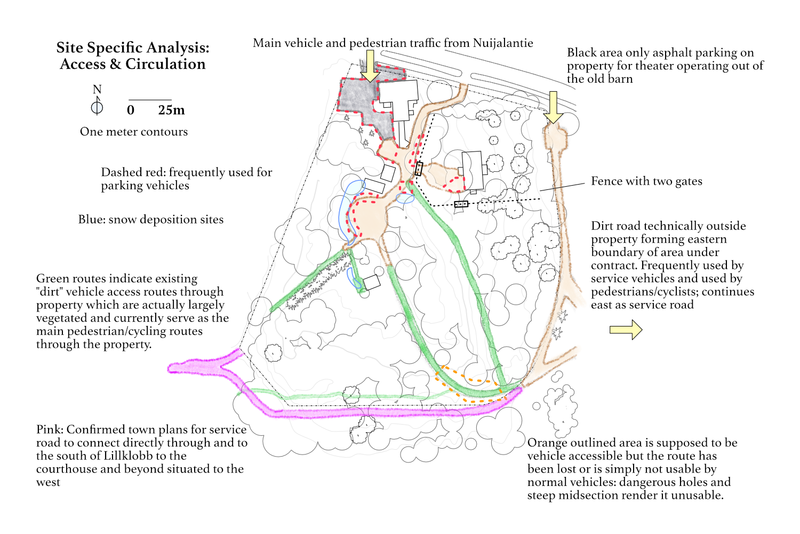 This is a bit of an issue as it restricts circular access through the site by vehicle (and thereby trailer, chicken tractors or eggmobiles) now and in the future city plans. The grade in this zone is basic 7.5%, which could become problematic. Both of these drives are in good condition. The southwestern drive turns left and loops back up the eastern side of the same ridge, potentially allowing for easy internal circumnavigation by vehicle. The pattern of following a ridge line falls within recommendations in Keyline Design patterning; though these specific routes may not be optimal, they are far from major design errors. In addition to vehicles, the site has pedestrian/bicycle access from the same north road and sees a fair amount of local residents visiting the site for walks, especially with dogs and in the autumn for apple picking in the old orchard. Visitors more or less stay on the existing routes, which include a footpath along the southern boundary of the property that leads westward towards Nihtisilta, a major public transport hub for Espoo. The only fencing on the property is a partial fence and hedgerow system around the yard of the major house. Two gates allow for vehicles to pass, though the southern gate is rarely used for that purpose. The fence does not extend all the way around the yard, rather, it terminates to the east near the drainage ditch and to the north leaving a gap to the spruce hedgerow that marks the northern end of the yard. It should also be noted that there are no fences protecting the highway to the south from animals or people.